(1)Every public authority must, in exercising its functions, have regard, so far as is consistent with the proper exercise of those functions, to the purpose of conserving biodiversity. 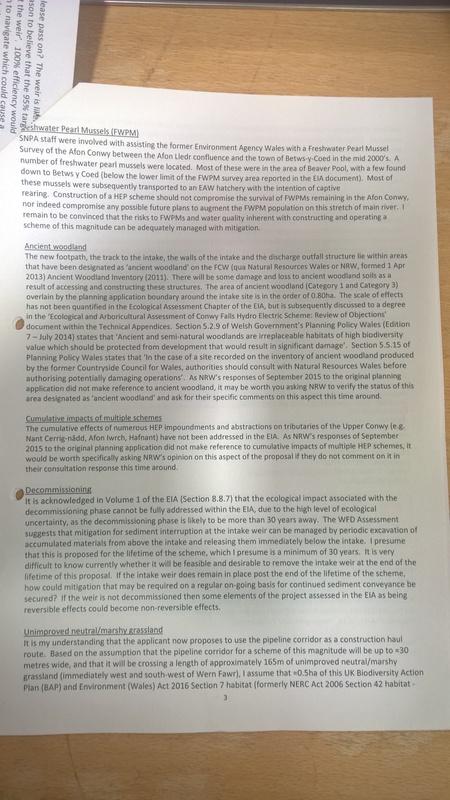 This act requires the Snowdonia National Park Authority (SNPA) to take responsibility for the biodiversity affected by this planning application, this responsibility cannot be legally passed to NRW to decide (although NRW can give advice and make its’ own judgement this does not absolve the SNPA from its’ responsibility). SNPA must therefore make assessment of possible biodiversity impact using either its’ own ecologist or by requesting help of an outside organisation such as the local wildlife trust or preferably both. 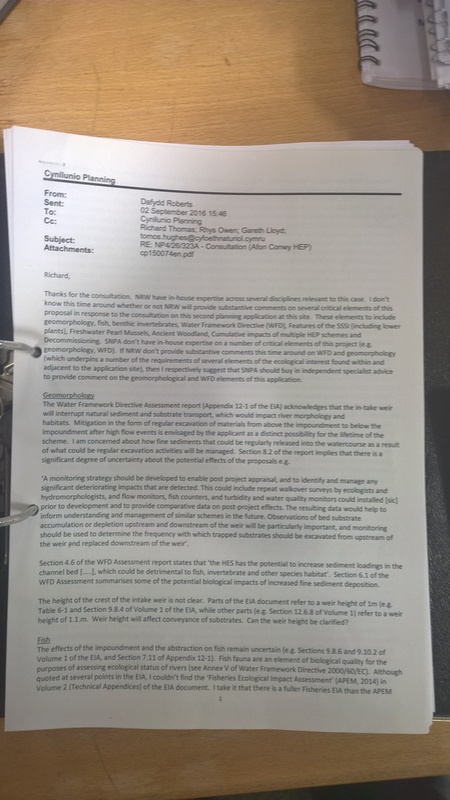 The applicant has proposed a considerable amount of mitigation through numerous design iterations to try and persuade the regulatory and consenting authorities to find the scheme acceptable. To my mind, there is a considerable amount of risk associated with this development, and a number of unknowns. It seems almost inevitable with a scheme of this magnitude and complexity that unforeseen circumstances will arise. I’m struggling to think of many HEP schemes that I’ve seen that have been constructed strictly a per submitted and agreed documentation. Experience has shown that in difficult terrain with many constraints, construction contractors and developers invariably cannot stick to all the methodologies submitted for planning approval, often with detrimental environmental consequences. 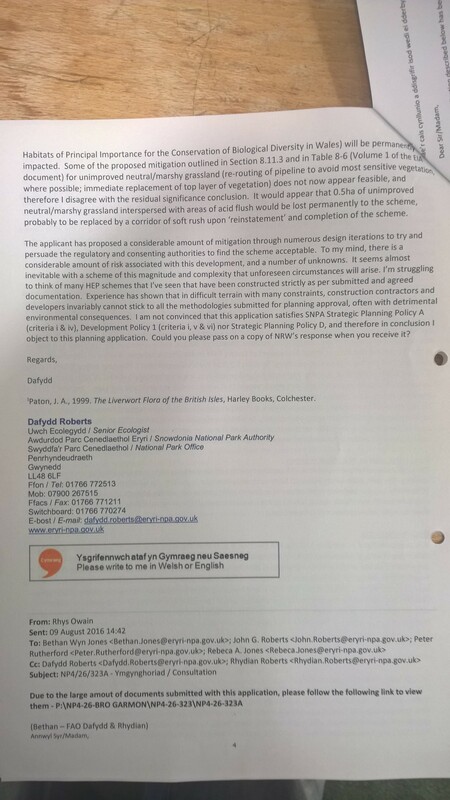 I am not convinced that this application satisfies SNPA Strategic Planning Policy A (criteria i & iv), Development Policy 1 (criteria i, v & vi) nor Strategic Planning Policy D, and therefore in conclusion I object to this planning application. ….. 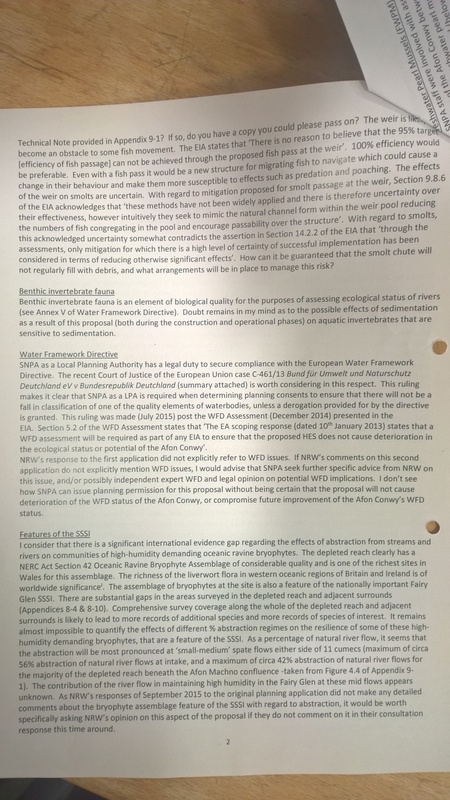 The full ecologist report is shown below. Please take time to read it through, it is thoughtful, considered and by an expert in this field. As a regular visitor to the SNP I view this application with horror. The size of the project can only be detrimental to the Park in every aspect. With advances in sustainable power this type of project is now obsolete with similar plant being decommissioned all over the world, leaving derelict plant rotting in the landscape.